HomeThe Hadith Critical Methodology: A brief look at how Hadith are authenticated in the Islamic tradition. Some time after the death of the Prophet, a need arose among the Muslims for an authentic source for the beliefs and ritual practices of the Prophet Muhammad (ص). The Qur’an, which was undoubtedly considered authentic and authoritative among all Muslims, did not provide much information about Muslim practice and Law. Indeed, it is the Hadith, that is, the sayings and actions of the Prophet Muhammad (ص), that provides the bulk of the raw material for Islamic jurists past and present. After the death of the companions and the generation who succeeded them, there arose a new challenge facing the ranks of the Muslim jurists. All those who had personal contact with the Prophet had passed away: There was no longer any early figures to tell the Muslims what the authentic teachings of the Prophet was. Forgery also became a huge problem in the Islamic lands: Sectarian and political turmoil produced an environment where putting words in the mouth of the Prophet to support one’s own cause was common. So how did Muslim scholars of Hadith, the Muhaddithoon, sift through the masses of Prophetic reports to single out the authentic ones? ‘Ali ibn Abdullah narrated from Abu Usaamah who said Hishaam told me from his father who reported from ‘Aishah. Perhaps it is more intuitive to represent this isnaad on a diagram: If the narrator is able to provide an isnaad like the one seen above, he has passed the first layer of the critical method. Note that right now his report is only a little better than hearsay. Did the Prophet Muhammad (ص) really have a sweet tooth? We still don’t know: Several other steps remain for us to take before declaring the report as useful. 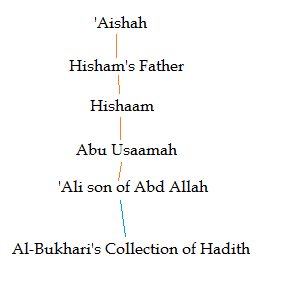 EDIT 1/1/15 : Hisham’s father’s name is ‘Urwah, and the next diagram reflects this change. 1. There is any information confirming that these people in the isnaad actually existed. If the narrator is not found in any of the biographical dictionaries, then there is a risk that the name is simply invented; the chain would therefore be considered weak. Another way of confirming the existence of someone is when he is quoted by name by several well-known sources of Hadith. 2. 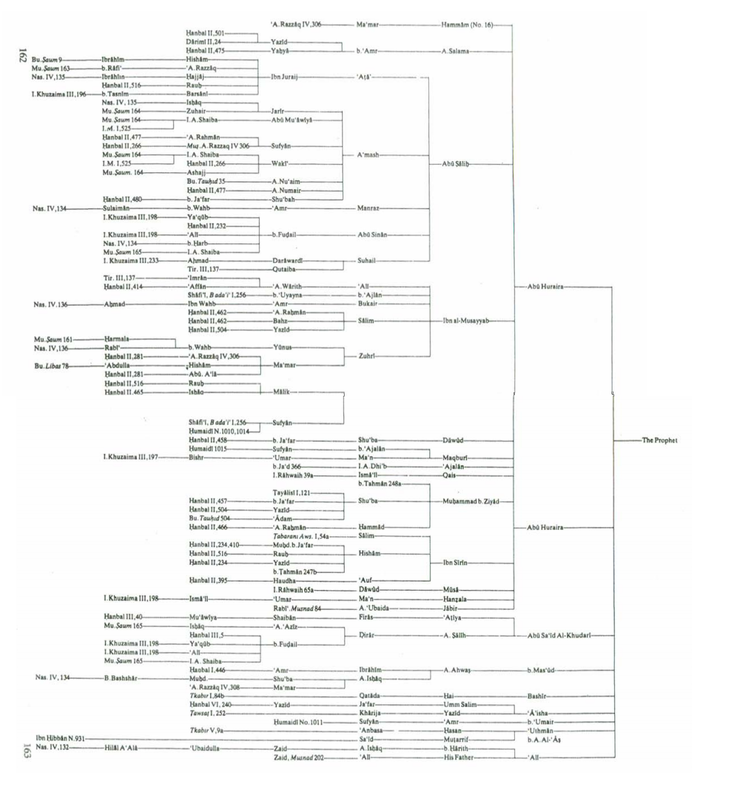 The lives of the people in the Isnaad actually overlapped. It is very difficult to place confidence in a chain where one of the narrators was born 30 years after the death of the person he supposedly heard the report from! 2. Their biographical situations make it plausible that these transmitters in the chain would report from each other. In summary, what scholars want to see is whether the isnaad actually makes sense. Ofcourse, some scholars would have stricter standards than the points mentioned above: Al-Bukhari, for example, wanted positive proof that the narrators met from those they said they heard from: it was not enough for him that they lived in the same general area, or that their lives overlapped. The individual reliability of the narrators was another thing that the scholars of Hadith were on the look out for. The hadith scholar had to go through all the reports of the narrators in the isnaad and check whether they were reliable sources of information. Lets look at Abu Usaamah as an example. How do we find out whether this man is reliable? One of the primary methods is looking for ‘multiple attestation’ among his reports. This means, if Abu Usaamah heard a Hadith from Hishaam, do we see that same Hadith being reported by the other students of Hishaam? It would only be logical that this be the case, if Abu Usaamah is telling the truth. Lets say for example, you’ve missed a class on one of your course subjects. You ask one of the attendees, named Zayd, this question: “Was there anything important in the lecture?” to which he replies, “X topic won’t appear on the final exam”. You then ask five other attendees about this matter- and you see that they don’t say anything of the sort; even though they should have actually heard this if the lecturer said it. Zayd’s report doesn’t spark much confidence now: we should play it safe and say Zayd is probably lying or he misheard the lecturer. Other criterion for transmitter evaluation is the religiosity and piety of a transmitter. One cannot at any cost accept the report of someone who has already been shown to be a liar and forger of Hadith. For a very good isnaad, all the narrators would ideally be scholars who are known for their practice and devotion to Islam. In this case the critics are somewhat flexible, after all, an expert forger would try his best to look like a devoted Muslim. Furthermore, even religious people can easily make mistakes- or forge material “for a good cause” as is the case for many ascetic forgers. Pious forgery is a well known phenomenon in religious traditions outside Islam too. Al-San’ani points out that accuracy (based on the multiple attestation criterion above) is far more important than uprightness. The Isnaad bundle that ‘Azami has rendered above gives us very good confidence in a Hadith report. We can see a large amount of attestation: it is hard to believe that this report is forged. The hadith appears in Madinah, Basra, Kufa, Mecca, Wasit, the Hijaaz, and Khurasaan at the 3rd level of the isnaads. It is widely multiply attested; some scholars would give it the “mutawaatir” grade. Perhaps I’ll edit this article to look for more Isnaads to corroborate our report on the Prophet’s liking for sweets, but for now, I hope this has given the reader a brief overview as to how Hadith criticism is done. And God knows best. Al-Azami, Mustafa. Studies in Hadith Methodology and Literature. 2002. Notes: This article approaches the topic of discussion the format of the “Three-tiered method” of Sunni Hadith Criticism that is introduced in Jonathan Brown’s “Hadith: Muhammad’s Legacy to the Medieval and Modern World”, but I have used more books (listed in the bibliography) to supplement this text. The so called three tiered method is only presented this way for ease of presentation, the Muhaddithoon don’t consciously call it that. ‘i’ which does not usually have the ‘e’ sound? Thank you for this! Jazakallah.